How much does it cost to travel to Shaanxi? How much money will you need in Shaanxi? ¥546 ($81) is the average daily price for traveling in Shaanxi. The average price of food for one day is ¥72 ($11). The average price of a hotel for a couple is ¥699 ($104). Additional pricing is in the table below. These average travel prices have been collected from other travelers to help you plan your own travel budget. Shaanxi is a province of central China-central geographically, culturally, and historically. 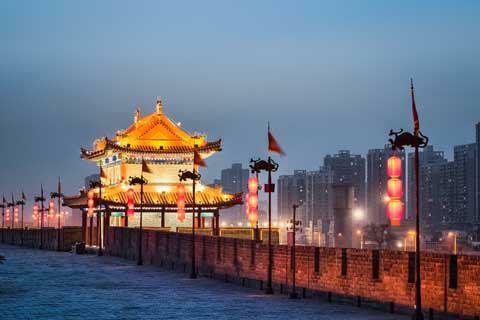 Its ancient capital, Xian (or Xi'an), was a starting point for the Silk Road and is also famous as the home to the Mausoleum of the First Qin Emperor, an archaeological site known for its thousands of clay soldiers called the Terracotta Army. Other attractions include the Hukou waterfalls, Big Wild Goose Pagoda, the Shaanxi History Museum, and the Great Wall of China on Huashan Mountain. So far as sights go, the highest concentration of things to see probably resides in the capital city of Xian. As mentioned, the grand Mausoleum of the first emperor of Qin is an archaeological site especially popular for its army of Terracotta Warriors and Horses. Together thousands of life-size pottery soldiers, horses, chariots, and weapons are arranged in battle formations, symbolically guarding the tomb of Emperor Qin Shi Huang. The Xian City Wall, complete with a mote and a circular park, is one of the most complete city walls surviving in China as well as one of the largest ancient military defense systems in the world. Other attractions in the city include the Big Wild Goose Pagoda and the Shaanxi History Museum, which is a modern national museum that displays a wide array of Shaanxi history, art, and culture as well as the development of ancient Chinese civilization. Another significant feature of the province is Zhenbeitei, more commonly known as the Great Wall of China. While the wall extends for over 5,000 miles from Laolongtou to Jiayuguan Pass, its heart lies at Zhenbeitai Great Wall on the top of Hongshan Mountain in Yulin, Shaanxi Province. A few other sights of the province include the Hukou waterfalls and Huangdi Mausoleum in Yan'an, as well as the Xian Bell Tower which marks the geographic center of the ancient capital. The Shaanxi Province can be divided into three regions: northern, central, and southern-each with unique geographies, histories, and cultures. The northern part mainly consists of the Loess Plateau and Maowusu Desert, with its best known cities being Yulin and Yan'an. Yulin was a garrison town on the Great Wall of China in the time of the Ming dynasty, and Yan'an is nicknamed the "Cradle of the Revolution" as it was center of Chinese revolution in 1937. Central Shaanxi is a place of rich culture and history, best known as the home of the Terracotta Soldiers in the city of Xian. Xian is also the capital city of Shaanxi Province and was the starting point of ancient Silk Road. Southern Shaanxi refers to the region south of the Qinling Mountains. Covered by mountains, valleys, and plains, it is best known for its beautiful natural scenery like Nangong Mountain National Forest Park, Zhashui Cave, and Yinghu Lake. From the famous Terracotta Army to the Great Wall of China there is no lack of sight-seeing to be had in Shaanxi Province. With a number of archaeological sites, large-scale tombs of emperors, imperial palaces, ancient buildings, temples, and monasteries, the province as a whole can be seen as one life-size museum. In addition to sight-seeing, though, activities include anything from shopping and watching traditional performances in the cities to hiking amidst mountains and the beautiful scenery of the Yellow River. The Tang Dynasty Dancing Show in Xian is an example of one kind of traditional entertainment, featuring costumes, Chinese musical instruments, and a storyline all derived from original Tang Dynasty art works. The cuisine of Shaanxi Province is best known for its pork and lamb or mutton dishes. The flavors are usually strong with a taste that is heavy and mainly savory. Cooking methods are typically steaming, frying, and stir-frying, and most dishes are accompanied by rice or noodles. Xian, in particular, is rich in local snacks which include the Crumbled Flatbread in Mutton Stew (Yangrou Paomo), Cold Noodles (Liang Pi) and Shaanxi Sandwich (Rou Jia Mo). The Shaanxi Sandwich is a kind of toasted wheat flour flat bread stuffed by finely braised and chopped pork, and is often paired with Cold Noodles. The noodles come in two varieties (rice or wheat), and are usually seasoned with ingredients like hot red pepper, sauce, salt, vinegar, mashed garlic, and bean sprout. Dumplings are also popular. In addition to traditional fair, Shaanxi Province also features international flavors including Sichuan, Indian, and Western fare. By plane, there are airports in the cities of Xian, Yan'an, Yulin, Ankang, and Hanzhong. Xian Xianyang International Airport is the fourth biggest airport in China. From Yan'an Airport, there are direct flights to Xian and Beijing, and from Ankang Airport and Hanzhong Airport, flights only run between Xian and Ankang or between Xian and Hanzhong. From Xian Xianyang International Airport, there are flights to major cities in China (like Beijing, Shanghai, Xiamen, etc. ), Japan, Thailand and South Korea. The airport is about 47 kilometers away from the Xian urban area, and takes about 1 hour to get there by expressway. By train, the railway transportation in Shaanxi is very convenient, and travelers can get to Shaanxi from most main cities in China.